With their short legs, extra-long body, and pointy ears, it's hard not to develop a soft spot for the Pembroke Welsh Corgi. While this stout pupster may look small this herding dog breed is super active and finding the best food can be challenging. We've done the research and here's what we found to be the best nutritious dry kibble to feed your Corgi with. When considering what the best Corgi dog food is, it helps to have some understanding about the background to this breed. If I keep up with my good looks, maybe humans will give me more food! 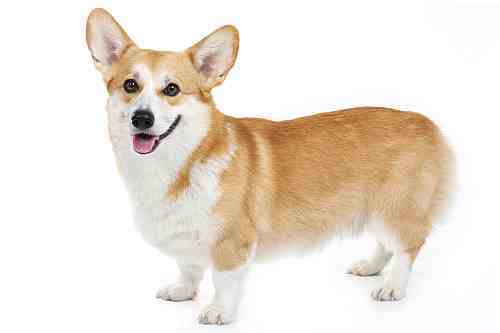 Historically the Corgi originated in Wales. The Welsh farmers bred the Corgi to withstand the harsh terrain and climate of their region. Originally the Corgi was classified as one breed; however, the farmers of Cardiganshire and Pembrokshire went down their own path to designing their own perfect herding dog. Today these two Corgi breeds are known as the Pembroke and Cardigan. Regardless of their origins, at first glance you can tell the distinct differences between the two. But to an aficionado the differences are a plenty. Corgis seem to have very few health issues. Some of the few issues that occur include: progressive retinal atrophy, spinal disc issues, an eye disease which causes blindness, ​canine hip dysplasia, weak immune system, and cataracts can crop up. It is recommended to have your Corgi x-rayed for hip dysplasia and other joint malformations which can lead to IVDD, and eye examinations are advisable. There have also been some incidences with temperament issues, manifesting as excessive barking and aggression, so care is advised in selecting a breeder and a puppy. Corgis love to eat, and weight can be an issue. So to help prevent overfeeding we have compiled a list of premium top rated dog foods that are healthy, free of junk and which meets your Pembroke Welsh Corgi's specific needs. As these come highly recommended by experts in dog nutrition, you can shop confidently. Here are the top three grain-free dry dog foods for you to consider and the reasons why we consider them as the best dog food for Welsh Corgis. Also listed are food options for overweight Corgis, for Corgis with a sensitive stomach and skin allergies and finally the best food for Corgi puppies. If you have tried many medium breed dog food brands in the past because your Corgi has been a picky eater, then rest assured this is one brand your Pem will love. 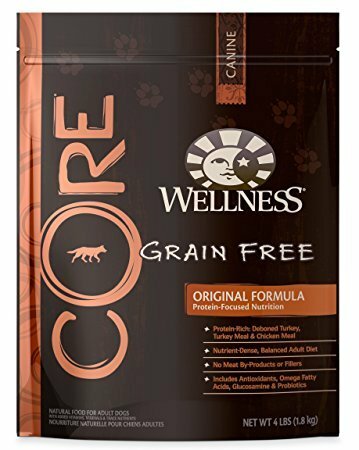 Wellness CORE earns a rating of five stars from Advisor and no wonder since dogs love their formulas. We highly recommend Wellness Core Grain Free Original Turkey & Chicken for your Corgi as this contains an above-average dry matter protein of 38% and is moderate in fat 16%, with a calorie count of 421 kcal per cup. Its core source of protein is deboned turkey (raw), turkey meal (protein-rich) and chicken meal (has 300% more protein than fresh chicken). It's compound formula also contains flaxseed which is known for its omega-3 fatty acids properties, prebiotics, minerals and an array of fruit and vegetables. It is 100% grain-free and contains no meat by-products or fillers, grain, corn, soy, wheat-gluten which can trigger allergies. In effect this formula will ensure your Pembroke Welsh Corgi gets the nutrition he or she needs to help them maintain their high levels of energy, have softer coats, healthy skin and healthy bacteria in their digestive tract. First Five Ingredients: Deboned Salmon, Salmon Meal, Peas, Pea Starch, Sweet Potatoes. Many Corgis suffer from food allergies and a grain-free fish diet is great for controlling allergies. 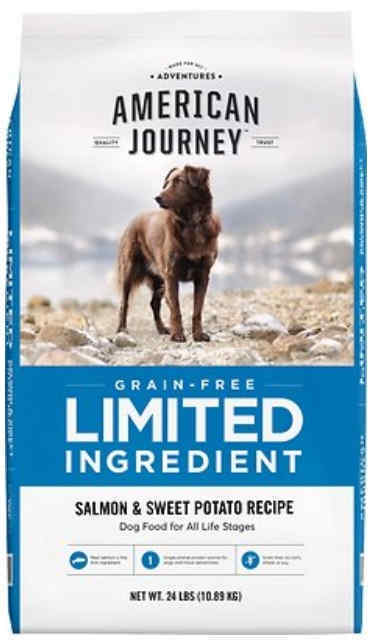 If your Corgi has skin allergies, itchy skin or a sensitive stomach consider this American Journey Limited Ingredient Grain-Free Salmon & Sweet Potato Recipe. This blend is made with a limited number of quality ingredients, and reduces the risk for triggering your pup's allergies. It is made with premium ingredients such as deboned salmon, salmon meal and sweet potatoes as well as flaxseed and canola oil as concentrated sources of energy-rich fats and great for keeping your dog’s skin and coat healthy. This food is AAFCO approved for all life stages, so it's a great food if you have multiple dogs. It is Chewy’s private label house brand and are currently offering 50% off the first bag! Made with easily digestible complex carbs such as peas and sweet potatoes, this grain-free kibble is ideal for Corgis with food sensitivities. It is free from corn, soy or wheat and has 330 kcal/cup, 25% crude proteins and 12% crude fats. Pups with sensitivities have found their skin looks great with the most noticeable change being their coats. They are soft and shiny after being on this food. Overall this is a very reasonable priced food for sensitive Corgis. American Journey has other recipes your pup might enjoy - including Lamb, Chicken, Duck and Beef. First Five Ingredients: Duck, Chicken, Chicken Eggs, Tapioca, Ground Flaxseed. Another five star rated brand which we highly recommend for your Pem. Why? It's packed with good quality and high proteins (47%) , contains moderate fat (17%) , with 496 kcal per cup. Main sources of meat are high-protein quality meat sources, in fact 90% protein is from real duck, chicken and eggs great for the skin, coat and immune health and easy on your pet's tummy. This recipe is free from corn, wheat and soy. It also contains a few interestingly added ingredients (tapioca, ground flaxseed, canola oil, pumpkin seeds and Biotin) and is gluten and grain-free. Calories check in at 496 kcal/cup. We also like the addition of vit. E. D and B12. It contains prebiotics which helps promote a healthy gut and montmorillonite clay which helps control diarrhea and irritable bowel syndrome (IBS). This is a wholesome formula and a fantastic dog choice for Corgis of all ages, including those with sensitive digestion. First Five Ingredients: Chicken, Chicken Meal, Chicken Broth, Oat Groats, Pearled Barley. 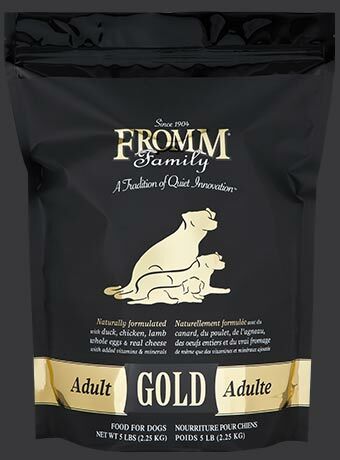 Fromm Gold Holistic Adult Dry Dog Food is manufactured by a Wisconsin based artisan food manufacturer who are committed to producing quality dog foods using the freshest ingredients. It continues to receive positive reviews mainly because of the quality of its ingredients. It's as close to human-grade food as you can get it. This formula is suitable for a normal active adult Pem and contains duck (raw), chicken meal (contains 300% more protein than fresh chicken), chicken (raw), brown rice, barley, oatmeal, menhaden fish meal (protein-rich). This recipe hits the spot with a near average dry matter protein of 25% with chicken meal being its main source of animal protein boosted up by the use of flaxseed which will help promote healthy skin and coats for your Corgi. Calories are coming in at only 418kcal per cup. Another important makeup in this formula is its high fiber content and the use of prebiotics which helps promote the growth of healthy bacteria in your dog’s digestive tract. Fromm Gold is recommended for Corgis with skin allergies. It's a pricier option than our first two choices, but well worth it, in my opinion. First Five Ingredients: Deboned Turkey, Turkey Meal, Chicken Meal, Potatoes, Peas. Corgis have a tendency to be overweight and this is no surprise since nearly 30% of canines are overweight and obesity is a very common Corgi health problem. This is due to the same cause of overweight in people; high caloric intake and low amounts of exercise. Your Corgi should have a visible waist. The abdomen should not be extended and there should be no fatty deposits on the hips or hindquarters. Your Corgi’s weight should be monitored closely because Corgi weight problems are linked to various other diseases. 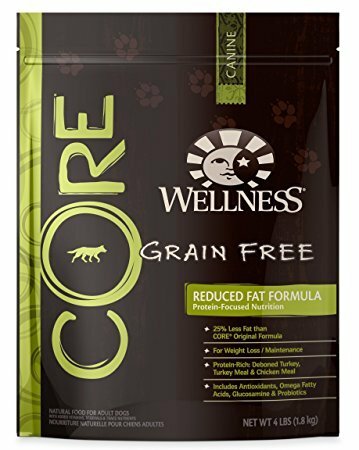 To remedy your Pem's overweight problem and help him or her lose weight we recommend Wellness CORE Reduced Fat Recipe using real turkey, chicken & salmon oil. This formula is low in fat (10 percent) which is what you want your dog's food to be. In addition to being gluten and grain- free, it also contains less protein (33%) than its Original formula (pick #1). In addition, this recipe also contains antioxidants, omega fatty acids, glucosamine and probiotics. 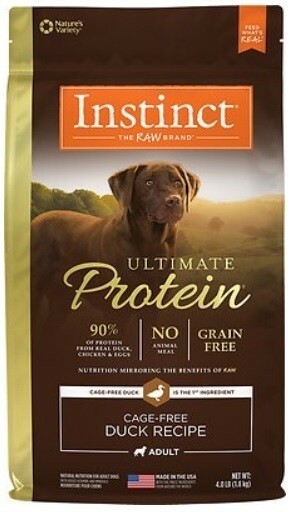 It has no fillers, by-products, corn, wheat, or soy and most importantly dogs seems to really enjoy the taste. Calories check in at 360 calories per cup. If your Pembroke Welsh Corgi needs to lose weight start them on this reduced fat variety slowly so that only by day seven are they fully fed this formula. Refrain from giving them unhealthy treats besides vitamins and supplements. Crash dieting is not recommended. The average weight for a Corgi is between 22-31 lb. for a male and 22-29 lb. for a female. As a result the initial recommendation then based on the above for weight loss is to feed them 1 - 1¼ cups per day and for weight maintenance is is between 1¼ - 1½ cups per day. If you also feed your Corgi wet food, then it is recommended that you reduce the dry food by ½ cup, for every 6 oz of wet food. If your Corgi is a couple pounds overweight and want him to lose the fat but don't them to be hungry this reduced fat/calories CORE recipe is the best "diet" dog food option for him. The number of skin problems that can affect your dog is so high that dermatology has evolved as its own veterinary specialty. Your Corgi’s skin is just as sensitive as human skin and can be irritated by many of the same triggers. Many dogs can have reactions to parasite bites such as fleas, ticks and/or mites. The bites can itch, erupt and in worst cases become infected. Dogs can also have seasonal and/or food allergies. They react in much of the same way to a parasite bite by scratching and biting themselves. This can make diagnosis difficult. If you suspect a food allergy you can potentially diagnose the condition yourself by switching your dog’s food for an entire month. For example, if chicken is the main ingredient in your dog’s diet switch to a food with lamb as the primary ingredient. If the symptoms disappear it is highly likely your dog has a food allergy/intolerance. If your Corgi has skin issues or has digestive problems we recommend a good quality hypoallergenic and limited ingredient dog food which contains fewer ingredients and thus can help you narrow down to what your Pem is sensitive to, like the Merrick's LID diet food reviewed below. First Five Ingredients: Deboned Salmon, Salmon Meal, Chickpeas, Lentils, Peas. 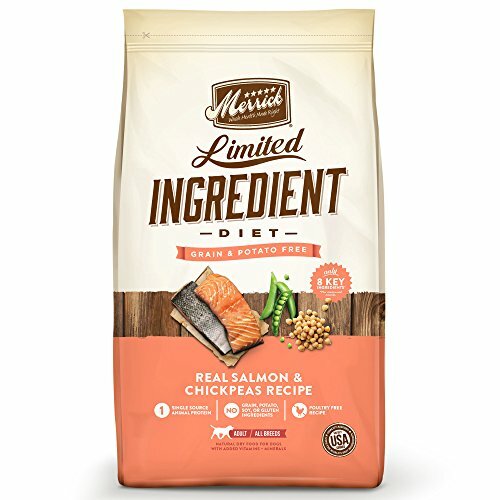 Merrick Limited Ingredient Diet Grain-Free Real Salmon & Chickpeas Recipe Dry Dog Food is 100% made in the U.S.A and one of the best dog foods for allergies. Merrick pride themselves in offering a healthy food for dogs and this formula is indeed a great example of that. This limited ingredient diet contains fewer components than other dog food formulas. It has limited use of proteins, uses easy to digest carbohydrates and is gluten, dairy, corn, soy, potato and grain-free. Suitable for all life stages. It uses a single source animal protein - salmon, which is better than the troublesome allergen - poultry which so many pets can become allergic to. This recipe contains dry matter above-average proteins of 29%, near-average fat of 15% and an estimated carbohydrate share of about 43% which is a lot lower when compare to other dry kibble. Calories are just 388 kcal per cup. Merrick LID diet foods come in other flavors so you if you want you can rotate and switch flavors around between duck, lamb and salmon. This way your dog is less likely to experience an allergic reaction to the food. We're sure your Corgi will devour this recipe, even the pickiest of dogs do! Another highly rated dry dog food but cheaper option that can be fed to Pems with allergic and sensitivity issues is Natural Balance Limited Ingredient Dry Dog Food - Potato & Duck and gets a four and half star rating on Amazon. Everyone wants their Corgi puppies to be happy. A great way to keep them happy and healthy is to ensure their puppy food has the same quality of food that you would feed to your own children or guests. However we know that Corgis love to eat, and weight can be an issue. Make sure to research your puppy's food before feeding it to them to help prevent overfeeding. 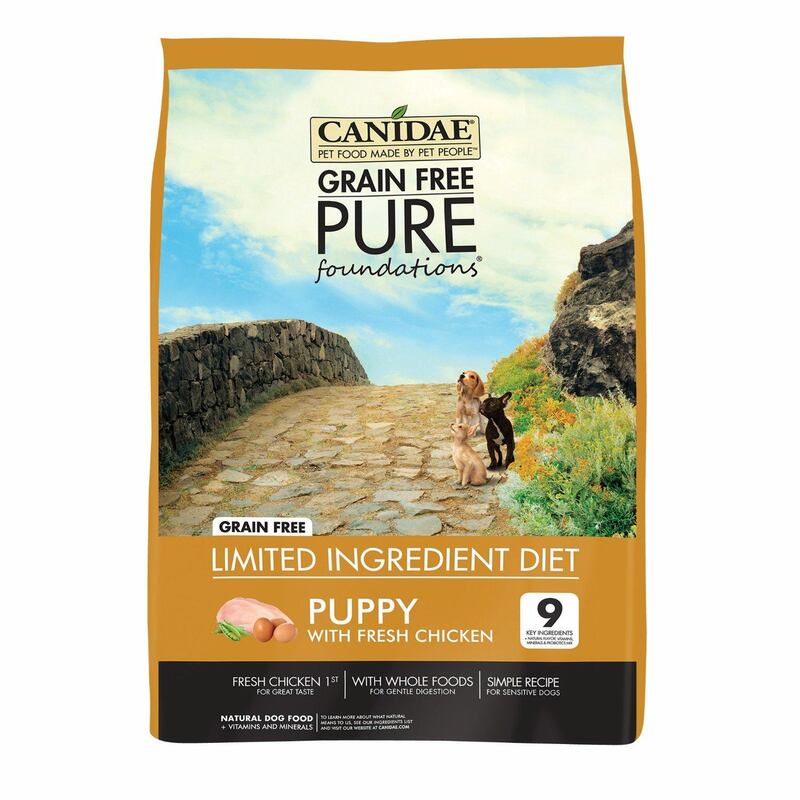 We have done the research for you and have found the best Corgi puppy food to be Canidae Grain Free Pure Foundations for Puppies with Fresh chicken. First Five Ingredients: Chicken, Menhaden Fish Meal, Lentils, Peas, Potatoes. We enthusiastically recommend CANIDAE Grain Free PURE Foundations Dry Puppy Formula Dog Food which also comes highly recommended by Pembroke Welsh Corgi breeders. Main meat sources in this formula is fresh chicken and menhaden fish meal (similar to herring). In fact, this Limited ingredient diet uses just 9 key ingredients for sensitive puppies. It has both gluten and grain-free and contains no corn, soy or wheat. This is an above average product with proteins of 30% and low fats of 12% and is well within the recommended AAFCO nutrition guidelines for feeding puppies. The formula is packed with wholesome and quality protein and vitamin-boosting ingredients such as peas, lentils, alfalfa and flaxseed to help promote healthy skin and coat in your pup as he grows up. Calories for this puppy recipe are 520 kcal per cup. CANIDAE are known for using only top quality ingredients and is made in the U.S.A so you can shop with confidence for your Corgi pup. WARNING: If you plan on cooking for your Corgi puppies on a regular basis, please consult a vet or veterinary nutritionist to learn about what foods are good and safe for them, and what their nutritional needs are. Stick with wholesome, unprocessed ingredients. Lean meats, whole grains, and vegetables are much better than leftover lasagna, or hamburger helper. Know and avoid foods that are dangerous for dogs, such as chocolate, onions, and raw garlic. Maintain a balanced diet. The rule of thumb for most homemade dog food recipes is 40% meat, 30% veggies, 30% starch, and 100% love. Add in homecooked food slowly. Sudden changes in diet can cause indigestion and diarrhea. Limit their dog treat intake. So, What's the Best Dog Food Your A Corgi? Ultimately, the best Corgi dog food is one which your Pem will eat again and again – one which meets their nutrition and lifestyle needs. What works for some dogs may not work well for others. We hope our list of the top rated foods for your fun little bundle will help you make a more informed decision when it comes to purchasing what is considered a very important aspect to your Corgi's life and overall health.